October 1 (MOVIE REVIEW) | ItuaLive! 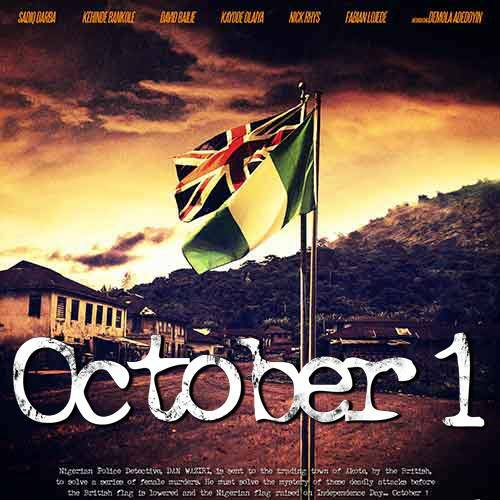 There is nothing particularly surprising about Kunle Afolayan’s feature film: October 1. One has come to understand the director’s predilection for brilliance. What is surprising however is Mr Afolayan’s attempt to create a work that he may never surmount. October 1 is a movie with a historical theme yet it grips the viewer spell-bound when it employs a crime and punishment sub-plot with the lead cast, Inspector Danladi Waziri (Sadiq Daba) commissioned to resolve the killings of young females in the fictitious town of Akote. Waziri is as tough as they come: He is a fiery-eyed, thin-framed northerner, whose reputation is archetypical of Sherlock Holmes and Mulder of the X-files series. October 1 is bold to confront issues such as sexual assaults in houses of worship, yet subtle in portraying a nation’s identity crises. It is the right movie for the time especially as we seek to rewrite our narrative and this movie could well prove to be timeless. The movie begins with a crime scene on September 1. A young girl is pursued by an assailant who strangles and rapes her. We later discover as we go on in the film that she is the first of many victims. After strangling, the killer carves an insignia into their chest. Inspector Waziri has been instructed to wrap up the case before Nigeria’s Independence as the British would officially hand over the affairs of governance on October 1. Waziri’s arrival in Akote coincides with Prince Aderopo’s (Demola Adedoyin) home coming. Aderopo has just returned from Nigeria’s Premier University in Ibadan. The town is agog with celebration because one of its own-Aderopo- is a University Graduate. Waziri wastes no time in the investigation and goes to the crime scenes. He is not impressed with Sergeant Sunday Afonja, the local police chief in Akote. He tells Afonja: “There is more to solving a crime that finding a dead body”, when he suspects evidence may have been tampered with. Sunday Afonja’s character gives the movie a lift. His inflections are uncanny and his bewilderment at Waziri’s insistence on interrogating the Ifa Priest creates an atmosphere for relief in the murderous town of Akote. Clearly Afonja fears Ifa more than he does Waziri. He doesn’t flinch in his decision to safe guard his native believes and tells Waziri, “Better to lose job than to commit taboo,” even when it meant his suspension from the police force. Another character, Agbekoya (Kunle Afolayan), a cocoa farmer central to unearthing the identity of the killer is introduced when Waziri asks him some questions. He is noncommittal and provides little in aiding Waziri’s mission. The viewer knows Agbekoya is lying. We don’t know why, but we are sure of it. We have seen little of him enough to make our conclusions but his nightmares of a priest beckoning on him leaves some crumbs. Prince Aderopo, and his two childhood friends one of which is Miss Tawa (Kehinde Bankole) a primary school teacher meet at a local bar to catch up on old times. They discuss the coming Independence and Aderopo’s views take the others by surprise: “This country is not ready for independence, give it seven years and this country will be at war.” His opinion raises some dust as it is clear all through the film that ethic distrust among the major tribes was apparent in the late 1960’s- Sunday Afonja did not believe Sumonu (Ibrahim Chatta); the palace guard (a man from his home town) was responsible for the killings and moved for his release. Instead he showed little resistance in arresting and detaining the Hausa itinerant found in the forest. Secondly Chief Okafor and the Igbo community accuse Waziri of shielding the accused man because they are of the same Hausa tribe. They accuse him of ethnic bigotry and someone from the mob shouts: “We heard what you did in Enugu.” Aderopo himself sneers with sarcastic disdain when he confirms Waziri is a northerner. “Seems you are a long way from home”, he tells Waziri. Kunle Afolayan poses the question of Nigeria’s readiness for independence subtly into our subconscious. October 1 is about pain: The pain of two little boys, the pain of Inspector Waziri, the pain of Chief Okafor (Kanayo O Kanayo) who resorts to poetic justice. Pain resonates all through the film and it is palpable when Agbekoya confesses a murder to Inspector Waziri. The acting on October 1 is crisp. It is replete with directorial brilliance. Prince Aderopo’s calm and poise when he stares Miss Tawa through his glass of wine at their rendezvous just before he makes his move is top-notch. Demola Adedoyin is the dark horse in this movie and he completely characterizes a man with bottled up pain and anger. Fabian Adeoye Lojede who plays Corporal Omolodun brings the viewer close to tears when the killer splits his throat with a knife. Corporal Omolodun clasps at his throats and falls to his knees with his dreams of marriage and a career at Sandhurst buried in the sands. Agbekoya’s attempt at Waziri’s life with a cutlass employed gymnastics akin to those found in favorite kung-fu movies. October 1’s painstaking display of antiquity- The 1964 Morris Minor automobiles, police officers’ uniforms, costumes, lanterns, aluminum torch lights reminiscent with the sixties- give the viewer a sense of history. She (the viewer) now understands and appreciates the struggles and nuances of life back then. This is of profound historical relevance especially in a country that runs from its past. October 1 also features a cameo appearance by Deola Sagoe who plays Funmilayo Ransome-Kuti, the rights activist. It is unclear whether a Funmilayo Ransome-Kuti in this film enhanced the plot because the scene is too short and left no punch. Except this was done for its historical important, the scene should not have made the cut. October 1 closes with Waziri giving a report of his investigation to his British superiors on Nigeria’s Independence Day. The astute Inspector once again is congratulated for successfully closing another case. This time though, he faced a conscience call. There are some aspects of the investigation he must cover up to “preserve” the dignity of Her Majesty’s government. October 1 provides many points for refection and questioning. Is the movie a parody of British misrule? Is Father Dowling a representation of what the British did to Nigeria? Are Prince Aderopo and Agbekoya a reflection of a damaged nation seeking to self destruct? And Is Waziri our conscience who fights to keep his integrity but losses out when the fight is too great? We may never know the answers to these questions but what is clear is that the foreboding will keep October 1 as one of the great Nigerian movies of all time.